I know I almost missed the boat (the S.S. grilling season). While this recipe came out at the beginning of summer (and despite its absolute simplicity), I was not able to make the recipe until now. I have always used wooden skewers, and this recipe requires metal skewers. 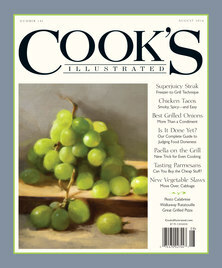 I ordered the $7 Norpro 12″ skewers as recommended by Cook’s Illustrated. The results were very-evenly-cooked, medium-rare steaks (in 2-1/2 hours). The intense heat from the chimney starter gave a beautiful char on the outside, and an even pink all the way through. No grey band. Unfortunately, I did not take a picture of the perfect evenness from top to bottom of the steak. Here are other people pictures of grey band, versus an even medium rare that you can expect with this recipe. 5-stars. My steaks took 2 full hours in the oven to come up to 120-degrees. Because the oven is so low, it is easy to perfectly cook the steaks. But if you want medium steaks; be prepared to wait up to an extra 30 minutes. Kosher salt is always recommended for when sprinkling on meat, because the flakes adhere better to the mean that the granules of regular granules of table salt. Also, because it is less dense it is easier to get an even coating of salt. As you can see from my photos; I made 3 sets of steaks instead of the 2 called for in the recipe. But because the grilling time is so quick; there are no adjustments necessary. Start time 4:00 PM. Ready at 6:15 PM. Remove 1/2 cube of butter from refrigerator and allow to soften on counter-top for an hour; or microwave for 20 to 30 seconds. Mix together the ingredients for the compound butter and refrigerate. Cut away the fat cap from the steaks; to prevent flare-ups. Set a rack to the middle of your oven and pre-heat to 200-degrees. Line a rimmed baking sheet with aluminum foil (for easy cleanup) and set a wire rack on top. Cut each steak in half crosswise; creating four 8-ounce steaks. 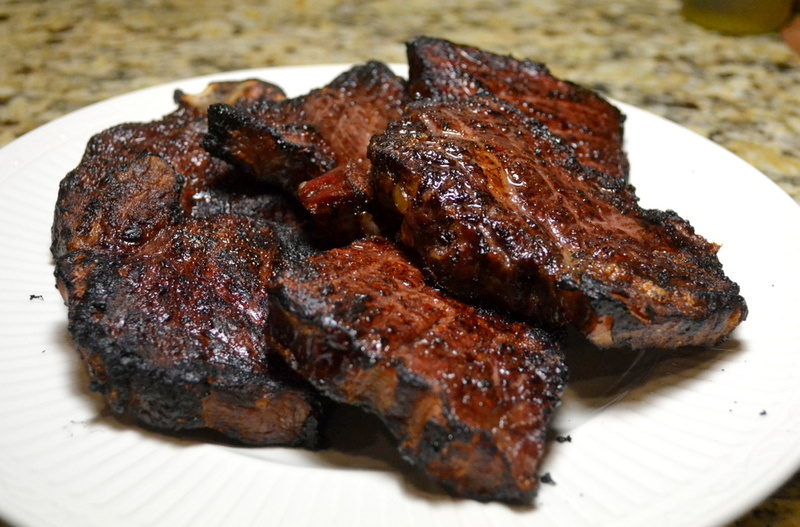 Cut 1/16″-deep slits on both sides of steaks every 1/4″; creating a crosshatch. Sprinkle both sides of each steak with 1/2 teaspoon kosher salt (2 teaspoons total). Lay steak halves flat on counter and pass two 12″ metal skewers horizontally through the steaks; spacing them 1-1/2″ apart, Be sure to leave 1/4″ space between steak halves. Set the steaks on the rack you prepared is Step 1. Repeat skewering process with the remaining steaks. Tent the skewered steaks with aluminum foil (still on wire rack); allowing to rest while you light to coals in the next step. Ignite a large chimney starter halfway filled with charcoal briquettes (3 quarts). After about 15 minutes when the top-most coals are completely covered in fine grey ash. Reserve the foil and pat the steaks dry with paper towels. Use tongs to place one set of steaks directly over chimney; resting the skewers on rim of chimney; suspending the meat over the coals (see photo below). Cook for 1 minute per side until both sides are well browned. Return the first set of steaks to wire rack in sheet, season with pepper, and tent with reserved foil. Repeat the charring process with second set of skewered steaks. Remove skewers from steaks and serve with compound butter. I never trust Chris Kimball when it comes to spicy food. His Yankee palate just doesn’t understand the flavors of southwestern cooking. True to form, today’s recipe is not nearly hot enough; zero-alarm chili. Also in the back of my mind is that Many of Chris Kimball’s chili recipes turn out to be very expensive (see this $26, 3-star chili). Plus my kids are just as happy with cheap, ground beef chili; So no reason to spend 3-times as much. As unlikely as it seems; Chris Kimball reaches a happy medium with this recipe; rich flavor of freshly ground chiles, but easy to eat (just 1/4″-chunks ). Plus it uses $3/lb ground beef. Of course, while not hot enough (next time I will add 1/2 teaspoon of cayenne pepper), there is a lot of delicious complexity here. Definitely worth making; 4-stars, but I could easily see a hotter version almost reaching the maximum 5-stars. It can sometimes be hard to find whole chiles, so I recommend buying them beforehand so you don’t have to run to multiple supermarkets. This recipe calls for Ancho chiles (in California they are called Pasillo; which are dried poblano peppers), but you can substitute guajillo which are hotter. 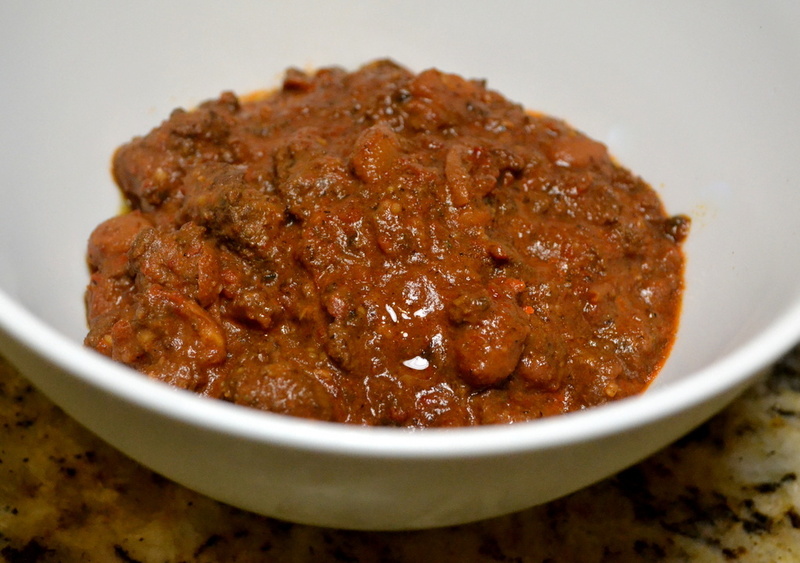 Chris Kimball says that this chili can be made up to 3 days in advance. I recommend re-heating on the stove-top rather than the microwave, for better flavor. Just add a little water to maintain the desired consistency. Cost: $11. (not including garnishes). Start time 3:00 PM. Ready at 6:15 PM. Additional garnishes: diced avocado, sour cream, and shredded Monterey Jack or cheddar cheese, tortilla chips and/or steamed white rice. Set a rack to lower-middle of your oven and pre-heat to 275-degrees. In a medium-sized bowl, add beef, 2 tablespoons water, 1-1/2 teaspoons salt, and 3/4-teaspoon baking soda. Toss until thoroughly combined, and set aside for 20 minutes. Meanwhile, remove the stems for the chiles and tear then into 1″-sized pieces. Set a Dutch oven set over medium-high burner; Add chiles and toast for 4 to 6 minutes until they become fragrant, stirring frequently. If the chiles begin to smoke, then reduce the burner. Allow to cool in the bowl of a food processor. 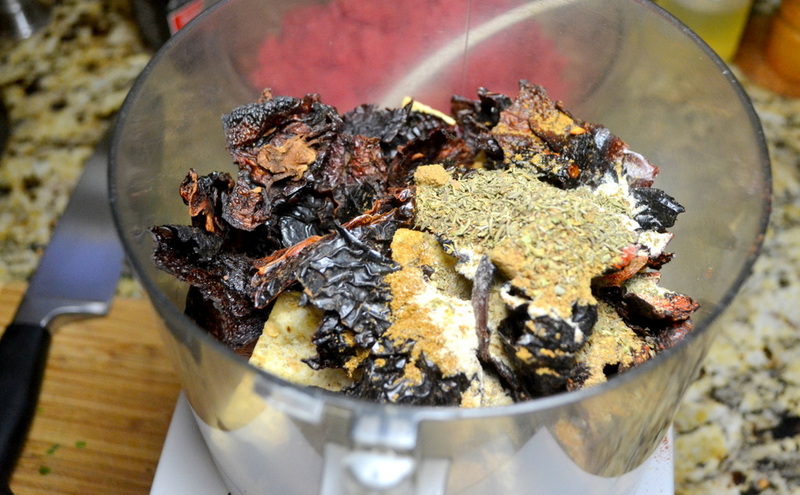 Add tortilla chips, cumin, paprika, garlic powder, coriander, oregano, thyme, and 2 teaspoons pepper to bowl food processor. Process for 2 minutes until it becomes finely ground. Empty spices into a small bowl. Process the tomatoes with their juice in the food processor for 30 seconds until smooth. Dice your onion and peel your garlic. Add 1 tablespoon vegetable oil to the empty Dutch oven, set over medium-high burner. Add diced onion at cook for 4 to 6 minutes until softened; stir occasionally. Press garlic directly into pot and cook for just 1 minutes. Add beef mixture from Step 1. Cook beef for 12 to 14 minutes; breaking up meat into 1/4″-pieces as it cooks. The beef should begin to brown and a fond should begin to form on the bottom of the Dutch oven. Add spice mixture from Step 3 and continue to cook and stir for 1 to 2 minutes; to bloom the spices. Add 2 cups of water, 2 teaspoons sugar, tomato puree, and pinto beans and their liquid. Bring up to a boil, and scrape the bottom of the pot to loosen any browned bits. Cover with lid, move to pre-heated oven. Cook for 1-1/2 to 2 hours until the meat is tender and chili has slightly thickened. Stir occasionally to prevent the chili from sticking. Uncover chili and let it sit for 10-minutes. Meanwhile, prepare any of your garnishes. After 10 minutes stir to re-incorporate any fat that has risen to the top and add 2 tablespoons cider vinegar. Adjust seasoning with salt to taste. Serve, passing separately the lime wedges, cilantro, chopped onion and other garnishes. With my two sons back in school, I’ve dusted off my various Sandwich Breads recipe and I’ve updated it to reflect my ever-changing bread requirements. Happily, I now have new standing mixer, which lets me build gluten the old-fashioned way (by kneading). 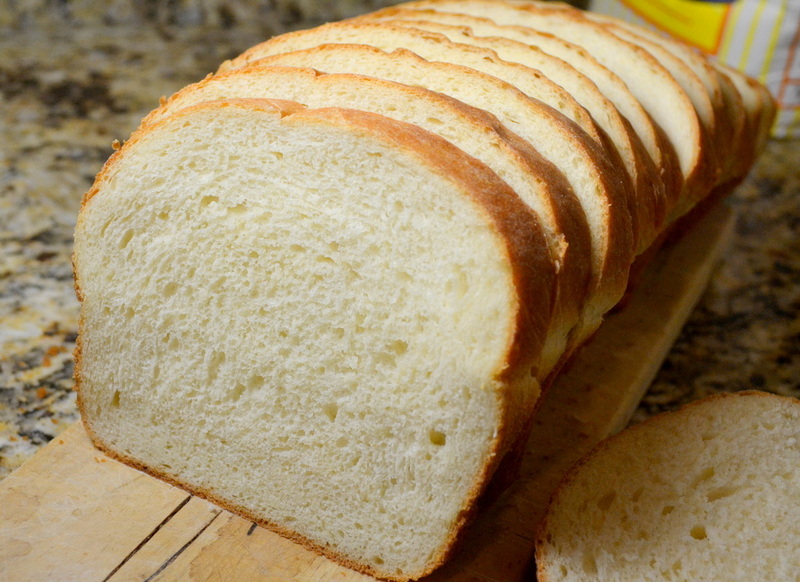 Kneading speeds the process of gluten development so much, that I can comfortable make a sturdy loaf in just 2 hours. Also, I replaced by broken kitchen scale with this cheap $12 scale. While I loved the functionality of my old $50 Oxo kitchen scale, I decided not to replace it because of it’s apparent fragility (it broke after a very small fall). Small 12-hour loaf without standing mixer. Large 12-hour loaf with standing mixer. Bulk Instant (Rapid Rise) Yeast. ($3/lb here). Enough for 72 loaves of sandwich bread. Bread made without any preservatives goes stale relatively fast. I make this bread sans preservatives and is still good after 3 days; mostly my bread only needs to last 3 days. If you want it to last all week; e.g. to bake this bread on Sunday and have it stay fresh through Friday’s lunch. I found a list of natural preservatives that can use in sandwich bread. I sometimes use granulated lecithin (which I bought online). Do not cut your loaf before it has cooled to room temperature (about 80-degrees). I recommend a full 3 hours of cooling time. I have sliced my bread after 2 hour, and the next morning woke to see condensation in the bag. If you ever see moister in the bag; put it into a new bag to prevent mold. Starting to bake the loaf at higher temperatures during the first 7 minutes (in Step 8) gives great “oven spring” so you don’t get a dense loaf. But reducing the temperature after 7 minutes you will also ensure that the crust doesn’t get too dark by the time the loaf reached an internal temperature of 200-to-205-degrees. I made two loaves this week because my Monday loaf turned out so lopsided; which my kids and I have dubbed Quasimodo. The loaf started out fine, but because the weather has been cold I let the loaf rise on my stove-top (while the oven pre-heated to 425-degrees). Unfortunately, half the loaf was too close to the oven vent and the loaf rose unevenly. It didn’t look too bad, until the oven spring kicked in and ended up extremely lopsided (in person the loaf looked even more lopsided than the photo). Adjust an oven rack to low-middle position. and pre-heat oven to 200-degrees, then immediately turn it off. You will use the residual heat of the oven to speed the first rise in a cool kitchen. Add water and milk to a Pyrex measuring cup (at least 2 cup capacity); heat in microwave for 1m until mixture reaches 105-degrees. Mix in yeast, sugar, granulated lecithin and olive oil; allow to hydrate for 5 minutes. While the yeast hydrates, add the dry ingredients to the bowl of standing mixer fitted with dough hook. Turn on standing mixer to lowest speed and slowly add liquid; use a rubber spatula to scrape out anything left at the bottom of the measuring cup. After the dough has come together, increase speed to 4 on KitchenAid mixer (medium-low on other models). Continue mixing for 10 minutes. The dough will become smooth, add a little more flour or water if necessary. Gently turn the dough out onto a lightly-floured work surface. Gently press the dough into a rectangle so that it corresponds to the length of your loaf pan. Spray top of dough with tap water and roll up into a tight log. Move dough into pan and softly press so that it touches all four sides of the pan. Spray top with dough with non-stick cooking spray to prevent the dough from deflating in Step 10. Cover loosely with plastic wrap (realizing that the loaf will grow above the top of the pan). Place it in a warm spot in your kitchen for between 20 minutes to 30 minutes; until the dough has doubled in size and does not readily spring back when you poke it with your finger. About 20 minutes prior to baking, begin pre-heating your oven to 425-degrees. Carefully remove plastic wrap, spray the loaf three times with tap water from a spray bottle, and place loaf pan in 425-degree oven. Set kitchen timer for 23 minutes corresponding to the total cooking time. After 7 minutes, reduce oven temperature to 375-degrees and turn loaf 180-degrees. Bake uncovered for 8 additional minutes until the top crust reaches your desired color. Tent with aluminum foil to keep the loaf top from over browning; baking for remaining 8 to 10 minutes. An instant-read thermometer inserted into the center of the loaf will reads 205-degrees when the loaf is done. Carefully remove bread from pan, and allow to cool on a wire rack for 3 hour before slicing (ensure that loaf is no warmer than 80-degrees). During my googling I noticed that many recipes call for Toasted Sesame oil; something not included by Chris Kimball. But he hit the nail on the head when he calls for broiling the fish 8-inches from the broiler element. A distance that allows for the fish to both caramelize and cook evenly at the same time. I made the version for only two people, because my older son won’t eat seafood. But the main recipe is for 4 people. While Chris Kimball says that the fish needs as little as 6 hours to marinate, I would suggest going for a full 24 hours to marinate. Even with 24 hours that flavors are subtle; given that the traditional recipes take up to 3 days. Because fish is so delicate, it’s important to use fillets of similar thickness so that they cook evenly. It is recommended to buy a large center-cut fillet (between 1-1/2 and 2 pounds, if serving 4) and cut into equal pieces. Any shade of miso can be used: yellow, red, or brown types can. But the recipe calls for the sweet, fruity flavor of white miso. In a medium bowl, add miso, sugar, sake, and mirin. Whisk together until sugar and miso dissolve; the mixture will be thick. Dip each fish fillet into the mixture to cover all sides of flesh (you can skip the skin). Set in a baking dish with the skin-side downwards, and empty any extra mixture over the fish. Cover with plastic wrap and put in refrigerator for 24 hours (bare minimum of 6 hours). Set an oven rack so that it is 8-inches from the broiler element. Pre-heat broiler. Put a wire rack in a rimmed baking sheet, cover rack with aluminum foil. Use your fingers to scrape away the miso mixture from the fish, and move skin-side down on to the foil. Be sure to leave 1″ between the pieces of fish. 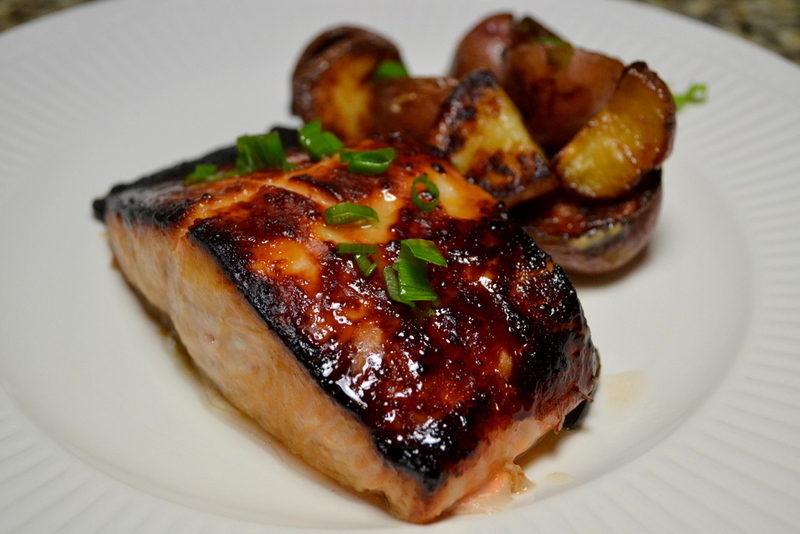 Broil salmon for 10 to 14 minutes; rotate 180-degrees after 6 minutes. The fish will be ready when the center of the fish reads 125-degrees on an instant read thermometer. Serve passing with lemon wedges. The chilly mornings have gotten me in the mood for soup (after a long summer soup hiatus). 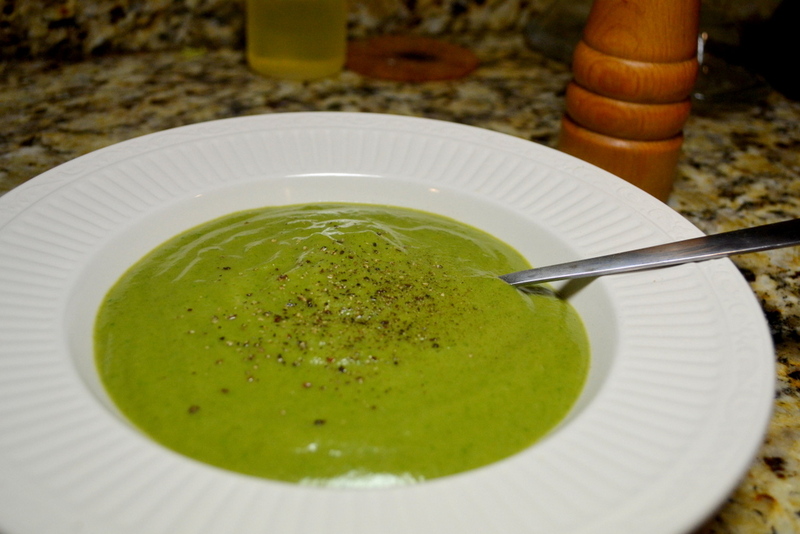 So I made a batch of this Broccoli-Cheese Soup. Preparing the broccoli took me almost 30 minutes; mostly because the recipe asks me to peel the stalks. However, I am now wondering if I misunderstood the extent to which the recipe requires me to peel the stalks (further discussed under issues section below). What I believe is an error in the original recipe, makes me believe that I overcooked the broccoli (See Issue #1 below). The overcooking gave the broccoli a slightly off taste. I can only give the soup 3-1/2 stars; though the soup has potential and I will try again. There was an error in the original recipe (I believe that Chris Kimball wanted me to reduce burner from medium-high so as to maintain a simmer; not the full boil over medium-high burner). In Step 6, the recipe says to “increase heat to medium-high”; but it was already on high from Step 2. I overcooked my broccoli; giving it a slightly off flavor. Peeling the Stalks. The recipe simply says: “stems trimmed, peeled, and cut into 1/4-inch-thick slices.” Unfortunately the instructions were unclear. I wasn’t understanding if I had to break each stalk of the main trunk and peeling each branch individually. This was a lot of work! I would recommend leaving the entire stalk as one piece and only peel away the outer skin that is accessible. When trimming the stalk; discard any leaves or blemishes. I would also recommend slicing off the bottom inch of the stem. Slice the remaining stem into the 1/4-inch disks. When removing the crowns, slice straight through the broccoli stem as close to the crown as you can get. Start time 5:00 PM. Ready at 6:15 PM. Prepare the broccoli by removing the florets and roughly chopping into 1″-pieces. Trim away and leaves and remove the bottom inch of the stem. Peel the stalk and cut into 1/4″-thick slices. Also roughly chop 1 onion. Set a large Dutch oven over medium-high burner. Add butter and when the foaming subsides, add broccoli (florets and stems), chopped onion, pressed garlic, dry mustard, pinch of cayenne, and 1 teaspoon salt. Cook for 6 minutes; stirring frequently. Add 1 cup water and 1/4 teaspoon baking soda. Bring liquid up to a simmer, cover with lid, and cook from 20 minutes until the broccoli becomes very soft. Stir once during cooking. While the broccoli cooks; grate your cheeses. Add 2 cups chicken broth and 2 cups water. Increase burner to medium-high. Once the soup begins to simmer, stir in spinach and cook for 1 minute until wilted. Carefully empty half of soup into jar of a blender (I used a bowl with a lip in order to spill less), add cheddar and Parmesan to blender. Process for 1 minute until smooth. Empty soup from blender to medium bowl (or pot if empty). Repeat the blender with the remaining soup. Return soup to Dutch oven and set over medium burner. Bring up to a simmer. Adjust the consistency of soup with up to 1 cup of water. Adjust seasoning with salt and pepper according to taste. Serve, passing extra grated parmesan separately. It’s been a month since we got back from our vacation, and it has taken a while to assemble this post. Of course, the main reason we came to South Africa was to go on safari; to see rare and exotic animals that you can only see here in Africa. We spent a week inside Kruger and were not disappointed, seeing all of the Big 5. Giraffe, elephant, zebra, buffalo and hippopotamus. We even saw the rarest of all; African Wild Dog. We saw many, many elephant. There is currently an overpopulation of elephant in Kruger. Leopards are elusive and usually spend their days sleeping in trees. We were lucky to have seen three. We were very lucky and saw over 20 Rhinoceros; including one while we were on a bush hike (with armed rangers). Even in my previous trip to Africa, I had never see Cheetah in the wild. We saw 5 cheetah; including two that walked just a few feet from our cars. It’s all just dumb luck; being in the right place at the right time. Kruger National Park is about the size of New Jersey, but when you consider the adjoined parks and private game reserves the actual size doubles. What is different about Kruger than other places in Africa is that you can go on safari on your own; without guides and in your own vehicle (with just your family members). There is a common misconception that people think they should go with a guide because they know where the animals are. 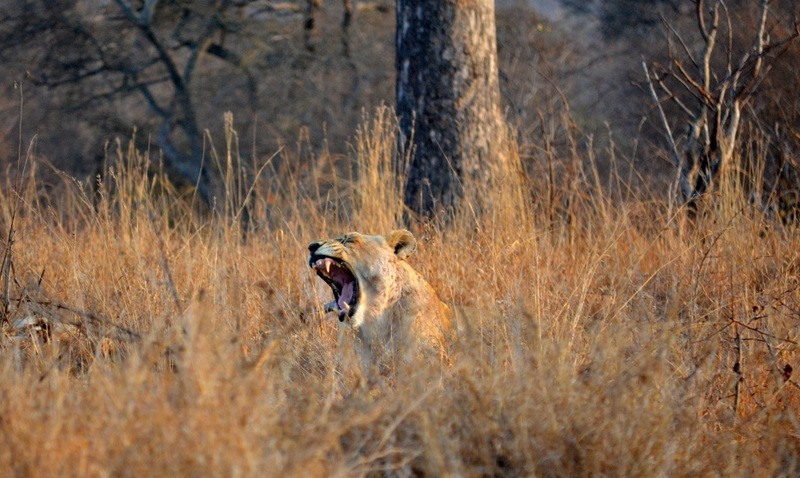 While guides are good at spotting animals in the distance, the excitement comes from seeing animals close up. The truth is that it’s all just plain luck; there is no secret spot where certain animals spend their day. Every day we went out we never knew what we would see; but we always saw something new. It wasn’t until about 3 days into the park that we saw zebra. Hyena are nocturnal. So we had to wake up at 5AM to see them as they walked back to their dens. We saw 3 over the course of our week inside the park. I didn’t realize ostrich were from Africa; until of coarse we saw some. Buffalo are part of the Big 5; and often travel in huge herds. Here are some of the miscellaneous animals we also saw. What is unique about Kruger is that the network of dirt roads allows you to safari on your own. You are currently browsing the My Year Cooking with Chris Kimball blog archives for October, 2015.